More than 200 union members in Hayward launched a three-day strike Tuesday morning, picketing outside city hall, demanding higher pay and further contract negotiations. Representatives of SEIU 1021 began marching around City Hall at 6 a.m. in response to what they describe as the city's refusal to bargain with them. The dispute revolves around a city proposal to have union members give up 5 percent in pay in addition to the 12 percent they gave up in 2010. Firefighters and some workers from other unions have already agreed to these concessions. 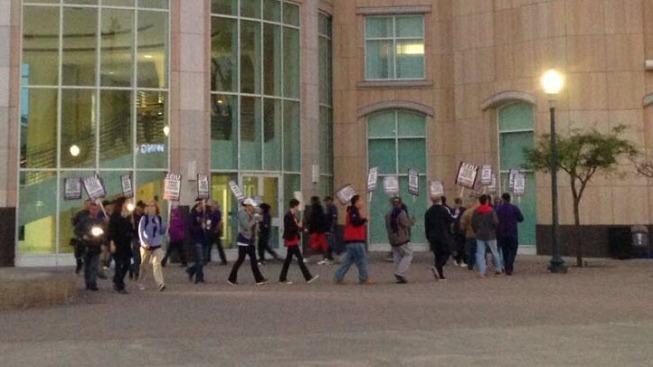 SEIU 1021 members told NBC Bay Area that they don't earn as much as those workers and can't afford any additional cuts. For their part, city officials promised that services would be running as usual, and essential services, such as 911 dispatchers and wastewater treatment plant employees would not be on strike. City managers have brought in temporary workers and retirees to help out. Managers also said they'd be working double shifts. Picket lines and a labor rally will be held at noon and again at 5 p.m. Tuesday at Hayward City Hall, according to union representatives.